Famous Teachers. Famous People from Bolivia. Bolivian Celebrities. The following are some famous teachers in Bolivia. You can read about more famous Bolivians by visiting our Famous People from Bolivia home page where you'll find many other categories. You can ask questions about a famous Bolivian person or add another famous person from Bolivia. A mathematician and high school teacher, he was born in La Paz and is one of the most famous teachers from Bolivia. He immigrated to the United States in the 1970’s where he gained prestige as a Calculus teacher for a class of young people from poverty-stricken homes with behavior problems at Garfield High School in Los Angeles where he taught until the 1990’s. His success as a teacher was portrayed in the movie “Stand and Deliver” in which Edward James Olmos played his part. 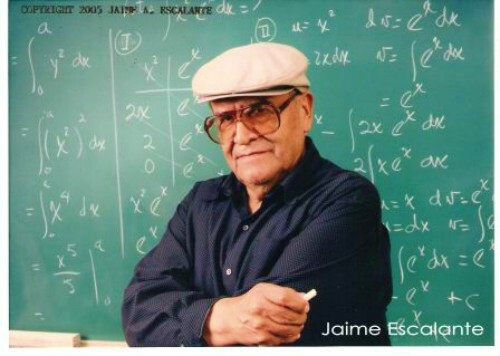 Escalante died of cancer in March 2010. A teacher, poet and storyteller born in Tarija. He based his works on the customs and folkloric fables of his native land to create children's stories and was also inspired by the reality of daily life in his poems, some of which have been put to music and converted into songs. His children's stories are often used in elementary schools throughout the nation. He died in 1963. A teacher, writer and diplomat born in La Paz. He held diplomatic posts in Europe, was a member of the Bolivian equivalent of the House of Representatives, and was also a journalist. He wrote various articles about Bolivian reality and children's education. He died in 1956. A teacher of Belgian origin. He was hired by the Bolivian government in 1909 to reform the national education curriculum, which he did very efficiently. He established the basis for founding the first teacher’s collage, the Mariscal Sucre Teachers College in the nation’s capital city of Sucre, where he personally trained several outstanding teachers. A teacher born in La Paz, he was one of Rouma's students and a great defender of the rights of rural inhabitants to get an education. He is the father of Bolivian rural education and established the Indigenous Teachers College in Warisata (La Paz). A missionary and teacher from the United States. She has lived in various parts of Santa Cruz for over half a Century, working first as an evangelical missionary and later as a teacher. She founded the Universidad Evangélica de Bolivia, the oldest in Santa Cruz and one of the first private colleges in the country, where she continues as its Chancellor. Born in Navarre (Spain) in 1927, he is a Catholic priest dedicated to pedagogy and social communication living in Bolivia since the 60s. He created with other Church officials from his order the Escuelas Radiofónicas ERBOL, an institution to teach radio broadcasting and radio-journalism that has educated a good number of distinguished radio reporters in the country. He also co-founded the Human Rights watchdog entity Asamblea Permanente de Derechos Humanos, that monitors civil liberties. He has written over thirty books, kept an analysis column for decades and authored numerous essays on communications, social justice, pedagogy, economics and other subjects, for which he’s been awarded a Doctor Honoris Causa and the Premio Nacional de la Cultura award. An educator and lawyer from La Paz, born in 1870. He was chiefly an university professor in his native city, but also a renowned theorist in pedagogy and sociology that wrote several books, essays, and whose ideas earned him a large following and the honorific title of “Maestro de la Juventud” (Youth’s Teacher). He occupied various positions in the national government, specifically in the Chancellery, of which he was Minister in two occasions, and the Education Ministry, where he was both a subordinate official and later the head minister. In the latter post, he hired in 1909 the Belgian educator Georges Roumá, that would be so important for reforming the country’s educational system. His second outstanding action in the same post was to set up the law codes that would regulate and organise the autonomous public universities all over Bolivia in 1930. He died in 1933. Born in Santa Cruz de la Sierra in 1891 to a French father and a Bolivian mother, he was a teacher and writer graduated as a Drawing and Cartography teacher from the Escuela Normal de Maestros in Sucre. He worked as a teacher in his city for years, also writing a book on the history of teaching in Bolivia. Then he entered to serve in the Chancellery, and was sent abroad in diplomatic missions, representing Bolivia in the peace treaty that settled the borders after the Chaco War. He wrote extensive history books about the hitherto neglected Eastern region that are highly regarded nowadays, and was founder of a daily and a pedagogy magazine as well as collaborating in other written media. The current university that educates teachers in Santa Cruz, first called the Escuela Normal Superior de Maestros, still bears his name after being upgraded.